This manual realized as a CCR cave instructor that there is a void of information available to the new CCR cave diver specifically in regards to dive planning. I feel that it is important for a student to be armed with information before attending a class. 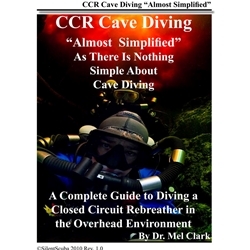 This book is an attempt to help the upcoming CCR cave diver get the most out of their class. Like my previous "CCR Simplified" manuals the goal is to put in simple words how to use the rebreather in the particular application, in this case the cave environment. The information in the manual is presented in an easy to read format and can be used in conjunction with any agency specific material. It is over 160 high quality full color pages.